When it comes to running your business, staying organized can save you time and money. Not to mention that properly storing your inventory, tools, and equipment can ensure a safer work environment for both customers and employees. That’s why Kanstor Inc is dedicated to providing professional storage and material handling products to Mount Pearl’s industrial, commercial, and institutional properties. With one showroom at our location in Mount Pearl and one mobile showroom, Kanstor Inc can give you a chance to browse our inventory of material handling products at your convenience. We also sell and install overhead doors and docking equipment. Feel free to browse all of our material handling products by downloading our SCN CATALOG. Since 1989, Kanstor Inc has been your one-stop shop for all your material handling needs. Not only do we supply equipment, but our factory-trained technicians can assemble, install, repair, and perform maintenance. Thanks to our fully equipped and stocked service vehicles, our technicians are available to work in-house, on-site, or remotely. Our factory-trained technicians are available 24 hours a day, 7 days a week for professional repairs. We know that broken down equipment can slow down your business’s productivity and affect your bottom line. Our emergency repair service can get you back on track in no time. 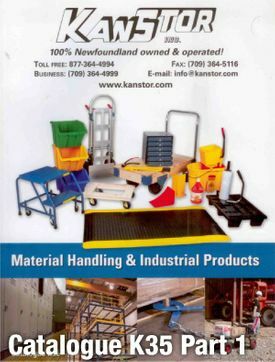 Kanstor Inc is locally owned and operated in Mount Pearl. Thanks to our location and well-equipped fleet, we can provide local delivery free of charge. Call to see if you qualify.